Head Coach Michael Schunot's famous saying, "One will get you two" might need to change after Saturday's 7-3 victory over Northwood University. After a tough overtime loss at home Friday night, the Wolverines traveled to Midland seeking revenge the next day. The team was prepared to bring their best in hopes to take 3 out of 4 points on the weekend. One player in particular though took his game to a new level. Brandon Pirtle of Davison, MI had a hot stick in Saturday's game scoring six of UM-Flint's seven goals in the contest. Pirtle's six goals surpassed the team's previous record for most goals in a game (5). But, what is interesting about the new record is it was broken against the same team and at the same rink that previous record holder, Jordy Makranyi, set the record. It still gets stranger than that. Both Pirtle and Makranyi wore the #10 jersey during their record setting performances. Was it another lucky night for the #10 sweater or do the Wolverines have a key to success when playing at Midland Civic Arena? In their 11 season history, UM-Flint is undefeated against Northwood University at the arena. In the end, the Wolverines would've liked to escape the weekend with four out four points, but after Saturday's big win confidence is very high for the team. 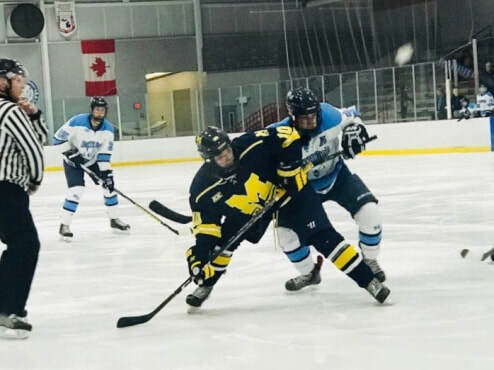 In their first two weekends of 2nd semester UM-Flint has taken three out of four points both times and is yet to lose a game in regulation during 2018. Regardless of the opponent or rink, it might be time for Coach Schunot to change his saying to, "One will get you two, three, four.. or maybe even six."